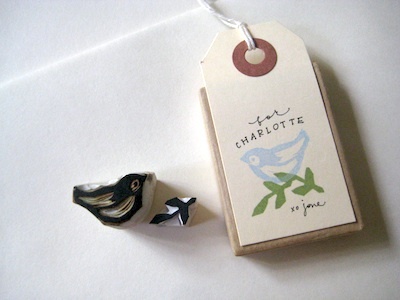 My lovely friend, Jone sent me this adorable stamp she carved. It's so tiny- about 3/4" wide and came with a tinier leaf sprig. All the things she makes and draws are so remarkable. It's perfect for my sampler envelopes and will be even more so once I get some colored ink pads. Isn't her handwritten teeny-tiny tag so delicate and dear? Most beautiful handwriting ever! Jone is also designing fabric for Anna Griffin's new venture, Blend Fabrics. We've had a great time sharing our plans and efforts to make the prettiest patterns for you. Seriously so exciting and so much fun! Quilt Market this year! It will be a first for me. My collection, Walnut Hill Farm, isn't quite ready to show you yet. It will ship for January so we're waiting to get closer to Market to put it out there. By now, the second collection is already created too. So hard to wait! I was supposed to be off on a girlfriends' getaway this week, but the airlines and Irene cancelled my plans. Using the time to make my kits for TCC and have them ready to ship west. The irony. That's where I was headed. The sun is shining here and hopefully my two friends are enjoying another gorgeous day in Park City. Sigh. I really do hope they are having a fabulous time! Makes me happy to imagine that. Sigh. Sniffle.